"The government is set to murder 5,000 badgers and yet all the peer-reviewed scientific evidence shows that the answer to the problem of bovine TB in cattle does not lie in this slaughter..."
This song is great. Download it from Itunes if you can. 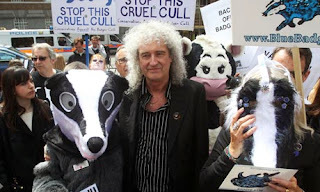 The Queen guitarist Brian May is heading for an unlikely hit after his protest song inspired by the badger cull reached the charts. The song, Save the Badger, Badger, Badger, was recorded by May and the internet entertainer Weebl and features the vocals of Brian Blessed. It has made the top 40 in the iTunes download chart and is the most popular track in the iTunes store top 10 rock chart. Blessed, who played Prince Vultan in the 1980 film Flash Gordon, which featured a soundtrack by Queen, said: "Brian May is absolutely inspirational and together we will beat the dark forces and save the badgers." Around 5,000 of the animals are expected to be killed in controlled shootings over six weeks in Somerset and Gloucestershire. Supporters say the cull is needed to tackle bovine TB, which can be spread from infected badgers. Those against the cull, including the RSPCA and wildlife organisations, say it is ineffective and inhumane. May said: "The British people are speaking in their many thousands, and yet the government is refusing to listen. "We thank them for buying this track and giving the badgers a voice. Let's get this to number one so [David] Cameron cannot avoid it. This cull is unscientific, unethical and won't work. "The government is set to murder 5,000 badgers and yet all the peer-reviewed scientific evidence shows that the answer to the problem of bovine TB in cattle does not lie in this slaughter and that this action will be ineffective and potentially damaging to the welfare of both farm animals and wildlife. "It is shocking that the NFU and the government have been allowed to continue with a politically led policy with no basis in science against the will of the people."